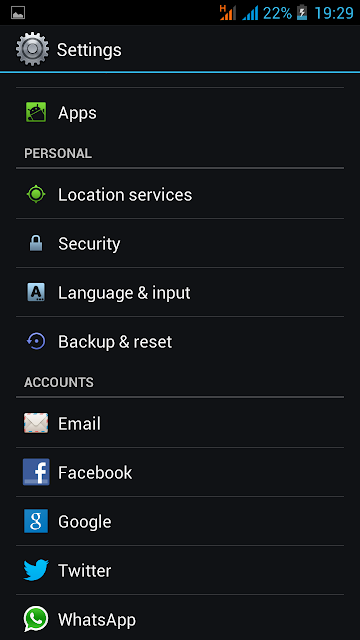 About a week ago, a friend rooted his Tecno Phantom A smartphone. He was so excited about the endless possibilities to customize his device so he kept installing a lot of applications that caught his attention unaware of the dangers some apps can create on rooted smartphones. Finally, he installed an application called Font Changer Lite and that was when it all happened. After installing this app, his phone attempted to reboot and instead of booting normally, the phone froze at the Tecno logo. It wasn’t going passed that state. He couldn’t boot into his phone. Practically, his phone was bricked and had to look for a way to unbrick and use his phone again. If you are presently in the same limbo state as described, please follow the instructions below step by step to fix your device. I recommend reading through first before actually starting the process. 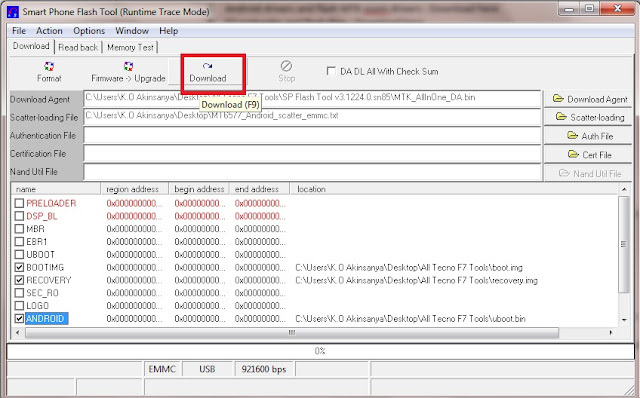 Kudos to Seunpayne of Nairaland for uploading his files for download and also giving instructions on the usage. The instructions below have been modified by me, especially with images so that it would be easy to follow and achieve success. Note: Read before you begin. All images are F7 specific. 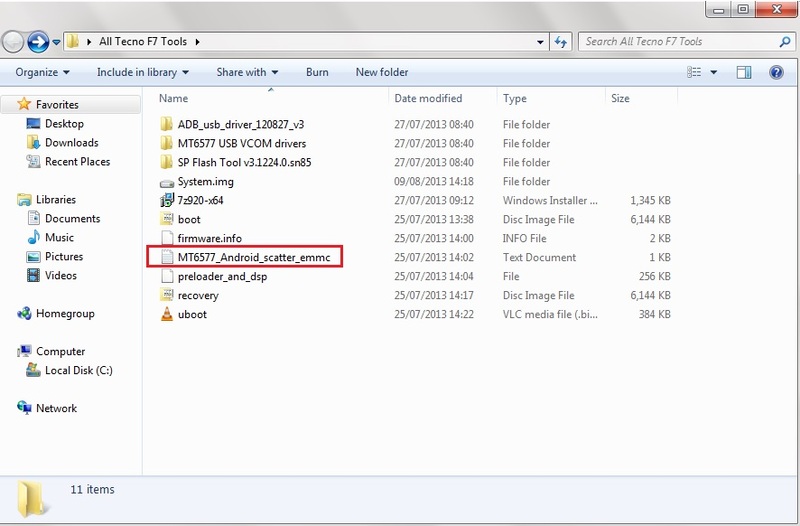 If you want to restore another Android phone that is not Tecno F7, you would have to download its image files. 11. Download all the files listed in the Needed Items section to your computer. They are all zipped files. 22. Create a new folder on your Desktop and name it Tecno F7 tools. 44. Install all the drivers located in “ADB_usb_driver_120827_v3” folder and “MT6577 USB VCOM drivers” folder. Also install msxml6.msi driver too: very important! 55. After installing all your drivers (WHICH IS A VERY IMPORTANT STEP), cut the “MT6577_Android_scatter_emmc”file. which is marked red in the above image. It’s a .txt file and paste it in another location on your Desktop. Make sure it’s not in the same folder as the other files. 66. 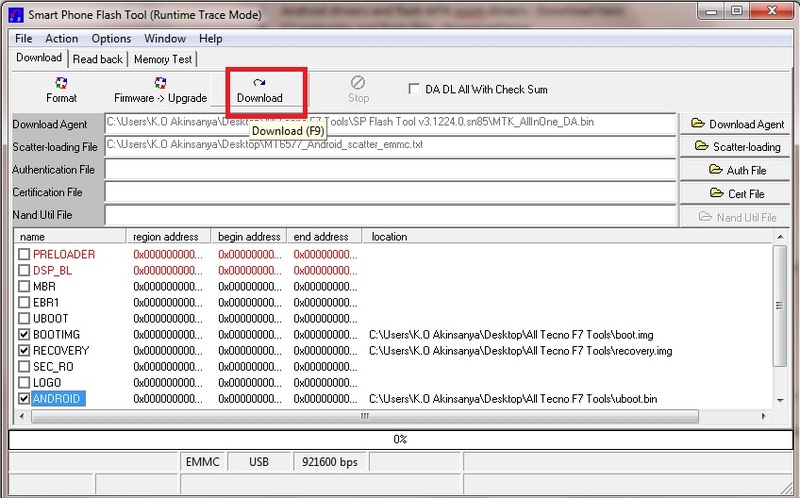 Locate the SP Flash Tool folder and double click on the blue Flash_Tool icon. This would open the flash tool. 77. From the flash tool, click on File top left and click on Open Scatter-Loading File. 88. Navigate to the MT6577_Android_scatter_emmc”file location and select the file. 99. Now check the boxes, BOOTIMG, RECOVERY and ANDROID as shown in the image below. 110. Double click on names BOOTIMG and select boot.img you downloaded. Also double click on RECOVERY and select the recovery.img you downloaded. Finally, double click on ANDROID and select the System.img file you downloaded. Once you have selected these files, the path would be displayed like in the image below. 111. Connect your F7 phone to your PC and remove the battery. Click on Download as seen in the image below. After Download is complete within 10mins, you will see a green circle on your desktop. 112. Remove USB cord from PC and insert the battery back into the phone. 113. Press Power button and Volume Up key button together. It will show you 3 options. Use the Volume Up ONLY key to navigate to Recovery Mode option and use the Volume Down key to select. 114. The phone will show you list of things to do. Use the Volume Up key to scroll to Backup User Data and use the Volume Down key to select it. 115. Now, put on your F7. Language would be Chinese which you can easily change from Settings. 116. To change language, just navigate to Settings (the wheel icon) and scroll to where you have the Language & Input (A is written beside it) and select your language of choice. After you have done all this, your Tecno Phantom F7 should be back on and functioning well. Please try to read reviews before you download any app, especially when you have root access installed on your phone. Also, Chainfire 3D could brick your phone. This procedure may be applied to other Android phones too. Only download their roms and recovery files.